Looking for a fabulous trip to undertake? With the strong dollar, Europe might be the go to place for the trip of a lifetime. 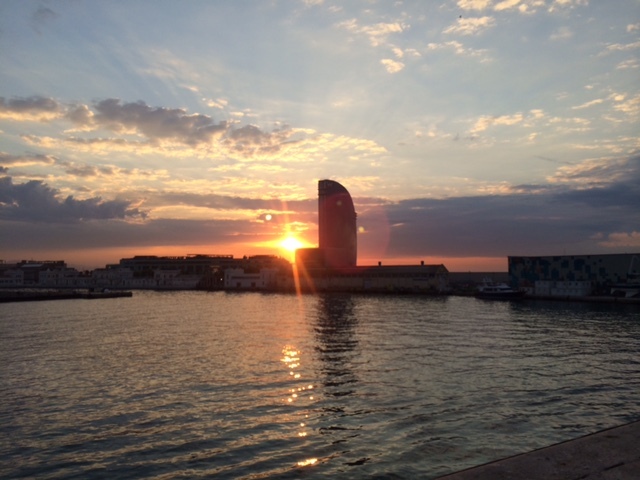 In the pages that follow, you can relive a fabulous 7-day memorable Mediterranean cruise that my wife and I took in the summer of 2014 from Rome to Barcelona, with before and after stops in each city. When asked if I would trade ten days in front of the big screen television watching World Cup soccer for the same time spent on a luxury cruise, it was a tough decision, but common sense and the desire for adventure prevailed. So, on a warm, sticky summer afternoon, we packed as much as we could into to large suitcases without being overweight and headed for the airport. Eight very restless hours later we arrived at Rome’s modern airport, and breezed through customs. The wait for the luggage was quite brief, and thus our adventure began in earnest. The trek over to the airport’s train station was remarkable short, and soon we found ourselves on a warm, unairconditioned express train to Rome’s downtown “Termini” station. It was less hot than Chicago, but a good deal more humid. The cool air came on only as the forty minute trip got underway. Out the window I saw some fields with hay rolls, a few apartment buildings, and the lush Italian countryside. A few squatters dotted the landscape as well, until we reached the outskirts of Italy’s capital city. The countryside gave way to more apartments, some office buildings, and a lot more street traffic. Rome is a beehive of winding streets, motorcycles, small cars, and trucks, buzzing around in a chaos of sounds and lights that somehow manages to function. The station itself was full of tourists and a plethora of locals outside ready to help you find your hotel, a ride, or some other destination, for a fee, of course. One of the most frustrating aspect of this place is the lack of street signs. Some of the wider boulevards are properly market, but most provide no clue as to what Via you are on. It didn’t help that we had the hotel name, but no exact address, other than it was “a ten minute walk” from the train station. In most places that might have sufficed, but not in this place. Tourist information was non existent, and we set off in a comical journey to find the hotel, schlepping our big bags with us. With the help of a kind local who called the hotel and a map, we at least got pointed in the correct direction, but no surer of where we were headed. The biggest hurdle was trying to figure out exactly how to navigate the labyrinth of streets in one of the world’s oldest cities. The cloudy skies began to darken more, and by the time we gave up and hailed a cab, it was a mere four blocks away (via a few one way streets) but well worth it as a downpour began not a few minutes after arriving at the Rose Garden Palace. Had we set out going west, instead of south from the station, we might have actually found it. Nonetheless, we found the charming five story hotel, located in the vicinity of the US Embassy. Since our room wasn’t quite ready we ate a delicious lunch in the hotel’s restaurant. I had a vegetable ravioli, and my wife Jennifer ate a pasta with eggplant. We shared a Greek salad loaded with grape tomatoes, feta, and olives. After catching up in some much needed sleep, we ventured out in search of a highly recommended gelateria. This time, however, we located the place on Google and wrote out the directions from the hotel. That helps if you don’t stray from the route, but we detoured by way of the fabled Spanish steps, then tried to readjust our route. We knew the place was near the Trevi Fountain, but it was still a challenge to find it. The fountain itself was enveloped in a scaffolding and was a bit disappointing. But the gelato was not. Gelateria di San Crispino (http://idgelatodisancrisino.it) was well worth the exhaustive search, as the Jamaican Blue Mountain coffee gelato was some of the best tasting gelato I’ve sampled. During our search we passed many outdoor cafes. One happened to be showing the Netherlands – Australia match so we doubled back there and watched the Dutch comeback and sipped a few glasses of wine. The News cafe had two TV’s tuned to the action, and we cheered on with several Dutch partisans. It drizzled on and off as we scrunched under the restaurant’s outdoor umbrellas. After the game, we able to reverse the original directions, but not before stopping at La Fenice (via F. Crispi, 68), a ristorante/wine bar/tea room, where we selected some delicious pastries for later consumption, as we watched Spain play itself out the tourney in their loss to Chile. I’ve watched soccer on Mexican television, The Italian announcers are quite tame in comparison. Fortunately, I’m well versed in soccer and can follow the action in whatever language is broadcast, which will come in handy when we reach France. It began with a typical Italian breakfast of cheeses, fruits, and pastry, along with strong coffee. Before leaving the hotel, we checked out their fitness room which had a nice variety of equipment, along with a sauna, and whirlpool. Next it was off to the Vatican. Our guide, Elena met across from the Vatican Museum. She was a thin, attractive thirtyish woman with an extensive knowledge gleaned from ten years of studying art history. We went right in via the guides’ entry, bypassing the people queued in a long line to enter the building. Our journey began in the picture gallery, which contained tapestries and paintings dating back to the fifteenth century. There is so much to see there, but we made the most of our three-hour tour, which also included the statue gallery, the old papal residences, the fabled Sistine chapel, and finishing with St. Peter’s Basilica. 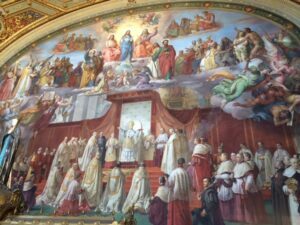 Before entering the Sistine Chapel, Elena gave us a very descriptive history of the artwork in the famous edifice, highlighted by Michelangelo’s creation of the ceiling frescoes. It was interesting to learn that even though the renown artist did use a scaffolding, he painted standing up. The frescoes have been carefully restored over the past thirty years, and a Japanese television network owns the photographic rights, and thus forbids the taking of photos. Also, due to the sanctity of the chapel, talking is prohibited. Tip: bring binoculars to get a closer look at the artwork. Lastly we toured St. Peter’s, one of the largest basilicas in the world. It is spectacular with it’s marble, tile, and gold interior. It is breathtaking with its forty-foot ceilings. We walked out via St. Mark’s square, with its marble columns by Bernini, a preeminent architect of the seventeenth century. Our cab ride back to the hotel, once again zigging and zagging through the streets reminded me of that old game with a wooden labyrinth and a metal pinball where you try to avoid falling in the holes. Once there, we collected our luggage and bid “Ciao!” to Roma. 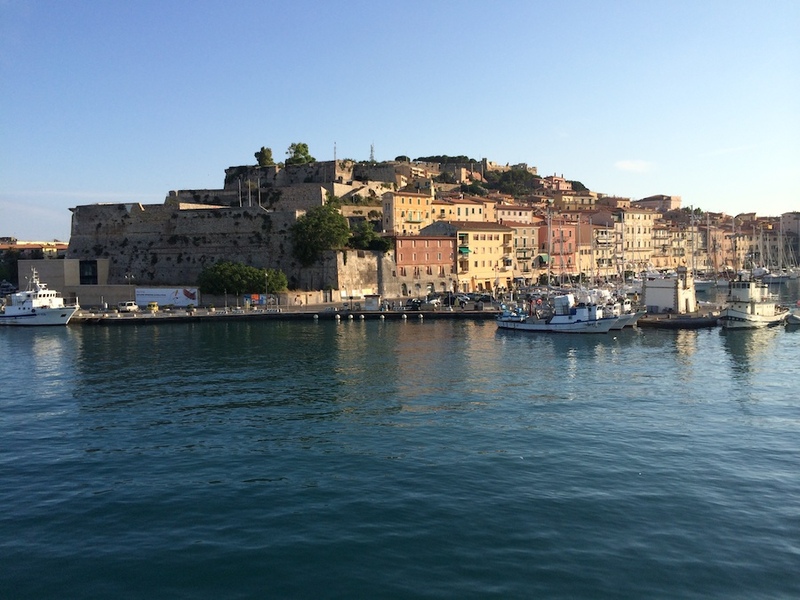 The Port of Citavecchia was no more than forty minutes by train from Rome’s train station. When boarding a train, be careful of hucksters who offer to validate your ticket (not necessary) or offer to guide you to your car and load your luggage. They will then attempt to extort an outrageously large tip for a token effort. Stand your ground or threaten to call the conductor. When arriving at the port, it is necessary to transfer to the ship terminal. It is too far to walk. There is a shuttle bus for .80 euros, but they don’t sell tickets on board. Instead, we opted for a taxi, who charged five euros to deliver us right to the embarkation door. It was well worth it as it was a circuitous route through the port area. It seems there are no straight routes in Italy. 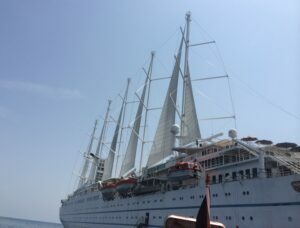 Our ship was the Windstar Wind Surf, a 535-foot long luxury cruising yacht, comprised of 153 state rooms capable of carrying 310 passengers and a crew of 191. It is dwarfed by the giant cruise ships, but instead offers an intimate, personal journey, with a friendly, caring, and knowledgeable staff. Boarding the ship was a breeze. Of course a small ship doesn’t have the logistical challenges that the mega cruise vessels do of loading thousands of passengers and their luggage. We promptly explored the ship, although it always seems to take a large portion of the voyage to get my bearings around the ship, regardless of size. 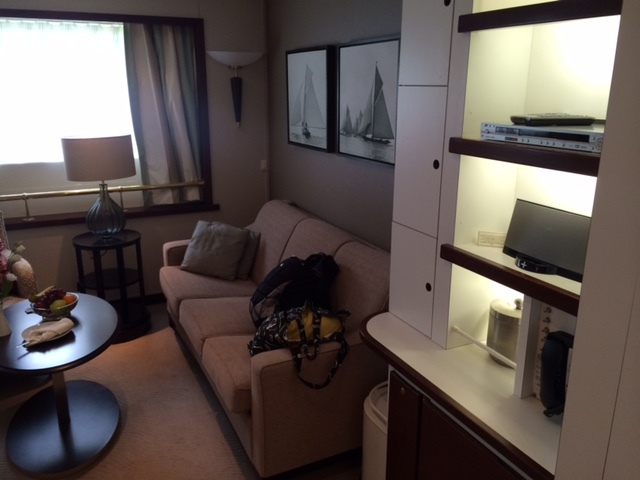 Our stateroom was actually a suite, comprised of what was formerly two adjoining rooms. So, in addition to the queen size bed, there were two of everything, bathrooms, desks, closets, plus a refrigerator, a couch, chairs, and a Bose iPod dock. There were also a surprising number of lounges, bars, and restaurants to spend your onboard time at. If our first dinner was any indication of the cuisine, it was very promising. Artichoke crepes, chicken stuffed with sun dried tomatoes, olives, and feta cheese. Others had corvina, a firm, large flaked fish, with a lime mojito sauce. It was a fun, long dinner. After, we moved the party to the “Compass Rose” lounge where, the evening’s entertainment, a husband and wife duo, performed quite a variety of songs, from Amy Winehouse to Neil Diamond, while our ship set sail to Portoferrio, on the island of Elba. We awoke early to get a good breakfast before heading off on an morning excursion to Porto Azzuro, located on the southeastern side of island. Our bus took a route up and over the steep hills flanking Mount Capanne, which afforded some terrific views of the port. Along the way there were a remarkable number of cyclists on mountain as well as road bikes traversing the same hills as our tour bus. These were not small hills. Apparently, this a very popular destination with German cyclists. We walked around the small village punctuated by the large number of anchored sailboats, and stopped at a cafe for coffee and a creme filled croissant. Our next stop was La Chiusa, a winery that has been in operation for more than an incredible three hundred years. There was a food spread including cheese, marmalade, and bread with olive oil and tepanade, as well as wines to sample. These delicious beverages ranged from whites and reds, and their specialty, desert wines. I would have liked to have seen more of the operation including the vineyards, and perhaps seen how they make the wine, but it was apparently not part of the excursion. We returned to the ship in time for a late lunch then set out on our own to explore the town of Portoferarrio. The town itself dates back to 1548. It held a very strategic location, and at various times was held by France, England, and Austria. In 1814, it was the seat of Napoleon’s first exile, but has been in Italian hands since 1860. Portoferrario got it’s name as a shipping port for iron ore from the local mills. With the decline of the iron industry in the 1970’s, it’s main income today comes from tourism. For three euros, we ascended to the top of the fort, which had magnificent views of the town below, and it was very obvious why the fort was invulnerable to invaders, then walked through the old town, with it’s narrow winding streets, some that were inaccessible by auto, before stopping for a drink and a chance to use WiFi to check emails and check in with the folks back home. Our jovial captain hosted a cocktail party where he introduced the senior members of the staff, each one to a different rock song, such as “Hungry Like the Wolf” for the head of the dinning staff, or “Hotel California” for the chief of the room staff. Dinner again included grilled halibut that was freshly caught, lamb chops, or filet mignon, along with sumptuous desserts like creme brulet and red velvet cake. The northern part of the western Italian coast is composed of steep, rocky hills that shoot out of the sea like angry waves of rock and vegetation. It includes the province of Genoa, and that’s where the town of Portofino is is nestled on a small peninsula of land jutting out into the Mediterranean, about 50 kilometers south of the port of Genoa. 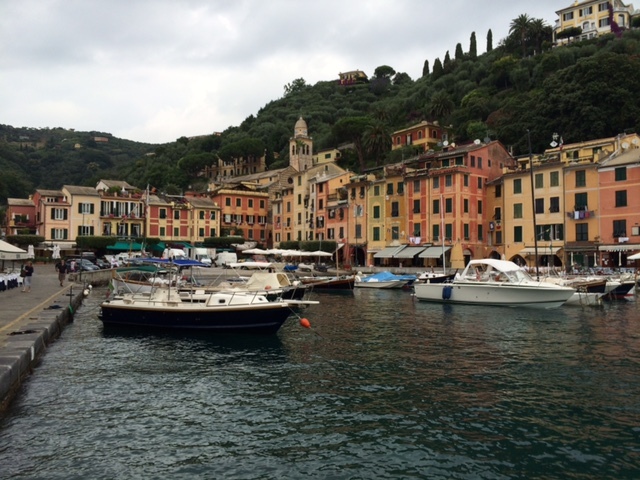 Portofino’s history can be traced back to the end of the first millennium. It has been a popular vacation destination for centuries and the presence of mega luxury yachts can attest to its continued prominence. You can only explore the area above the harbor on foot. The walking path is lined with slate stones and newer brick. To lug any supplies and equipment up to the houses there requires a contraption that looks like a motorized wheelbarrow with tank treads to navigate the many stair steps along the way. We walked to the lighthouse on the rocky outcropping overlooking the entire bay, stopping at a small church with a mausoleum containing the last resting places of some of the towns residents. Along the way is the Brown Castle. It cost 6 euros to enter, and was well worth it. It sits on the site of a Roman lookout. The castle, built in the sixteenth century had been restored in the nineteenth century, and again in the 1950’s. There were many photographs from the early 1900’s pertaining to then owner, who was the British consul in Genoa, and his many guests. Among the pictures where photos from his trips to China. After returning the main square by the port, we sat down at a cafe to check our emails and sip some expensive drinks. A beer was 7 euros (about $10). The one nice thing is they never chase you away, or make you feel guilty that you are monopolizing the table. You also get served potato chips and tomatoes in olive oil with your drinks. Next we set off to walk/hike to the nearby town of Santa Margartia. The first portion was a path above the main road connecting the two towns, offering wonderful views of the area below. The last part of what turned out to be a five kilometer (3.2 mile) trek is along the road. Below us were the beaches. Some were small strips of pebble. Others were literally rocky outcrops were people found any flat surface and laid out on towels. Where the beach was a bit larger beach clubs sprouted, where the locals could rent lounge chairs and umbrellas. Some even had bars or restaurants. We waiting until we reached the town to grab some lunch. Bar Guili (http://www.bargiuli.com/) tuned out to be a nice choice with a substantial menu of pasta, fish, and pizza. Unfortunately, we missed the shuttle boat back to Portofino, and not wanting to wait around for the next hourly departure, we grabbed a taxi back to town. It was an expensive proposition, with a fixed rate of 35 euros. Interestingly, we passed a line of stopped cars on the way back. A policeman waved our driver through. He explained that the police limit the amount of vehicular traffic into city. Otherwise, the area could not accommodate all those cars. Back on the ship, we had another excellent dinner and participated in a name that tune contest, which our group won. It didn’t hurt that most of the songs were right up my alley, including the Doobie Brothers, Otis Redding, Lynyrd Skynyrd, and other pop songs which my wife and other members of our entourage knew. We won a bottle of champagne that we split twelve ways. Instead of the pine trees and picturesque houses that sprout from the hills above Portofino, some of the most expensive hotels, apartments, and condos rise above the harbor in Monte Carlo. There was probably more wealth docked in the harbor than in net worth of some third world countries. One cruise passenger commented to me that it cost fifteen thousand euros a day to dock in a slip there. Whether or not that’s true remains to be seen, but that fact was there were some massive yachts there, including a few that might require a small country’s army to maintain. Having no set plan, we stayed late on the ship and took advantage of the on board marina, and went kayaking around the Windsurf. There were many boats and yachts zipping around the harbor, so we never strayed far from our mothership. After lunch, we took the tender into port, and proceeded up the hill to where the National Oceanographic Museum (www.oceano.mc/en) is located. Since we have a world class aquarium in Chicago, we skipped it, but it’s worth a visit, and a lot of tourists were going there. 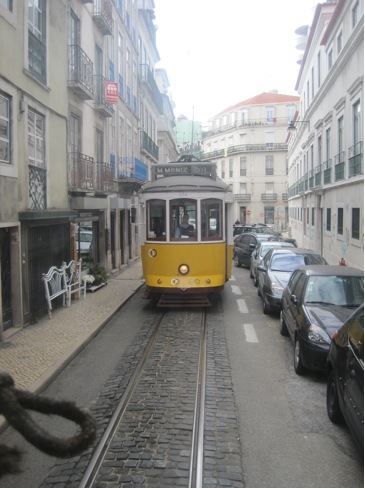 Instead, we took a thirty minute tram ride around downtown, complete with simultaneous translation into twelve languages (via headphones). 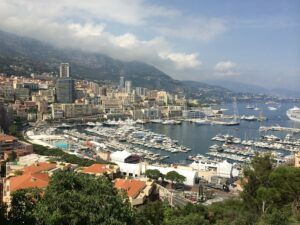 As we approached the old city of Monaco, it felt like were on a tram through Disney World. An beautiful palace, immaculate streets, and ornate gardens reminded me very much of the Magic Kingdom, except that this was for real. 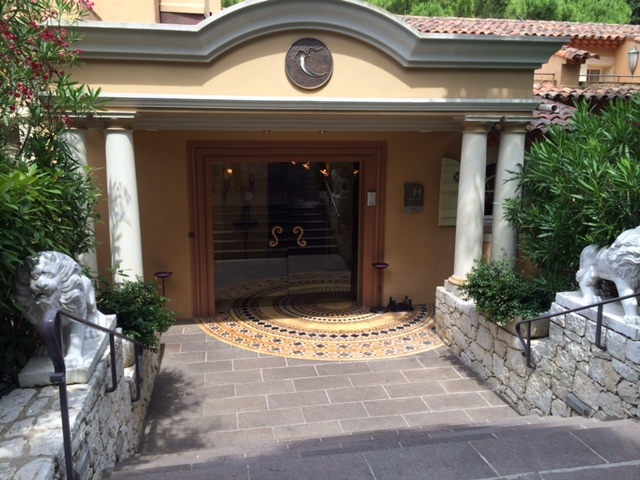 Our self guided tour of the old city included a required stop at the Chocolaterie de Monaco, close to the Prince’s Palace, a must for any chocoholic, like my wife. Next, we walked towards the fabled old casino, but due to the distance, we got less than halfway, before climbing aboard a town bus for two euros to complete the journey. We cut through the Fairmont Hotel parking lot, where an assortment Rolls Royces, Ferraris, and Aston Martins were valet parked. I poked my head into the casino, but was not about to pay the ten euro entry fee. Other passengers confirmed that beautiful marble columns and stained glass ceilings in the lobby extended into the casino itself. They also noted that it was a subdued atmosphere, with no loud bells and whistles on the slot machines. The table minimums were 25 euros, which probably would have precluded me in the first place. Eventually we made our way over to Quai Antoine 1er (Antoine the 1st street) where Stars and Bars (www.starsnbars.com/) was located. This American style sports bar, conveniently near the dock, was my first opportunity to see live World Cup action in four days. The Belgium – Russia matchup turned out to be eighty minutes of inaction, followed by ten minutes of spectacle as the Belgians scored a late goal and hung on for dear life. It was a pretty good deal for the 3.50 euro draft beers, considering what prices were elsewhere in the notoriously expensive town. Even though we had a late departure well after midnight, we decided to return to the ship for dinner, and skip the South Korea – Algeria tilt. There was no way we’d make it for the USA game, which also began at midnight. Instead, I had to settle for the score updates on Sky Sports, which were pretty regular. It was only later that I found out that Portugal tied the contest at the last possible second. My wife the travel agent arranged for us to visit the Les Mas Candille (http://lemascandille.com) hotel in Mougins, twenty minutes from Cannes, our next port of call. We disembarked next to the Palais des Festivals, where the Cannes Film Festival is held every year. Mark Silver, the property owner himself, picked us up for the ride into the hills above the coast. 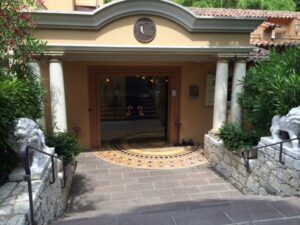 Silver’s path from health club proprietor in the English countryside to owning a gorgeous 46-room luxury hotel on nine acres in the French Riviera would be it’s own fascinating story. Upon returning to Cannes, we walked around downtown, did a lot of window shopping, and as usual, my wife found another top caliber chocolatier. We made our way back to the ship to relax a bit, have another excellent dinner, and enjoy the crew talent show, which included some terrific singing by various members of the ship’s staff. 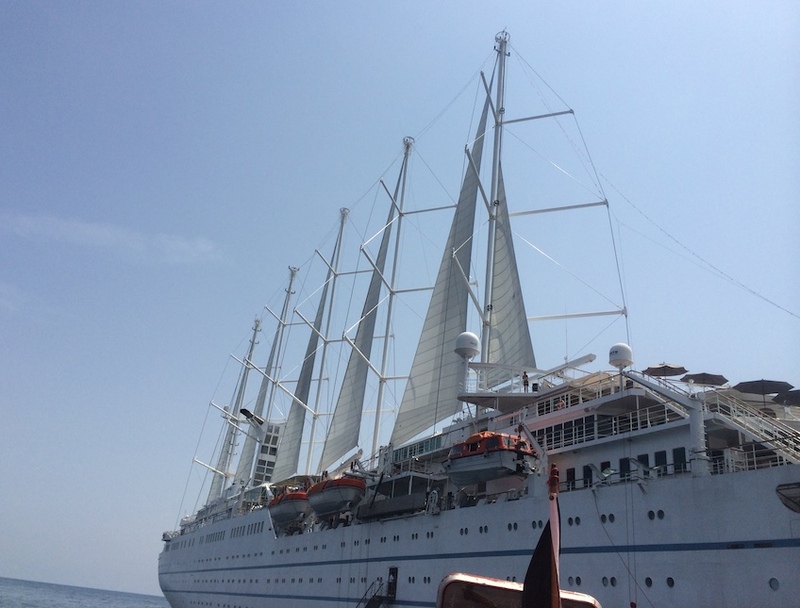 A ferry strike in Marseilles forced the Wind Surf to dock in Surnay-sur-Mer instead. Politics aside, this turned out to be a blessing in disguise. Hooray to the ship’s staff for making all the necessary arrangements to bring a vessel of this size into a sleepy little port town of 17,000 and to rearrange all the excursions to depart from a new location. 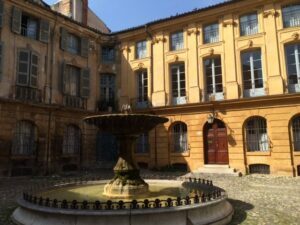 Speaking of excursions, our half day trip to Aix-en-Provence became a six and a half hour field trip, due to the change of port, to the heart of old Provence. It was well worth it, as an excellent and extremely knowledgeable guide led us on a walking tour of the old city, including a fascinating medieval church, and a visit to the studio where painter Paul Cezanne spent his last four years. This two story building on what used to be the outskirts of town has been kept in the same condition that the fabled Impressionist artist left it at the time of his death in 1906. There were many items recognizable from well known works including small statues, vases, and skulls provided by his physician father. Aix is a bustling university town, and there were students and young adults everywhere. It was also market day, and a vibrant flea market was set up on one of the main streets in town where vendors were hawking, t-shirts, dresses, shoes, fabric, the local soaps, and more. We also passed the farmer’s market where I was finally able to procure some farm fresh goat cheese. French pastry, crepes, and even pizza were consumed during this excursion. 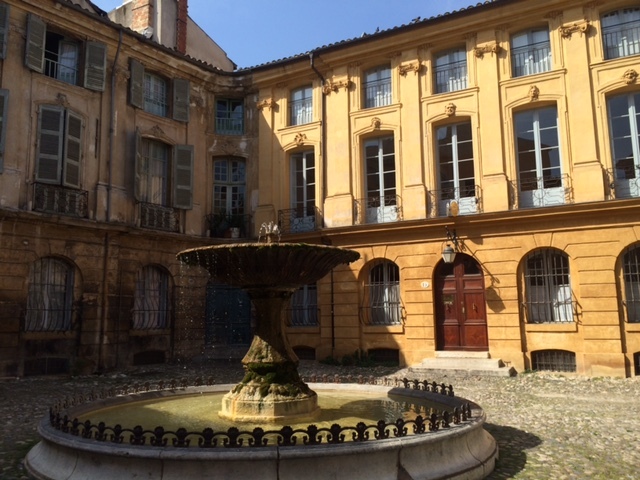 It was just great fun to stroll around the old section of Aix, with it’s sixteenth and seventeen century buildings. Upon returning to the ship, I was finally able to get out on the water on a Hobie Cats, one of several boats available through the “marina” such as windurfers, kayaks, and paddle boards for the passengers. This night’s dinner was an outdoor barbecue, in which the passengers were served up carved meats, paella, shrimp, lobster, and a whole lot more on the upper deck of the ship. It was a little warm at the start, but by the time the sun began to sneak towards the horizon, it turned pleasant and comfortable. The last full day on the water. After a morning on the ship, we boarded the tender for Port Vendres, France, a fairly small commercial port, whose main business appears to be fishing. However, as the closest French port to Africa, there was a big container ship in port. The large vessel seemed out of proportion to a village with a population of only 4500, but there seemed to be one branch of every bank in the country there, as well as a number of restaurants and cafe along the wharf. 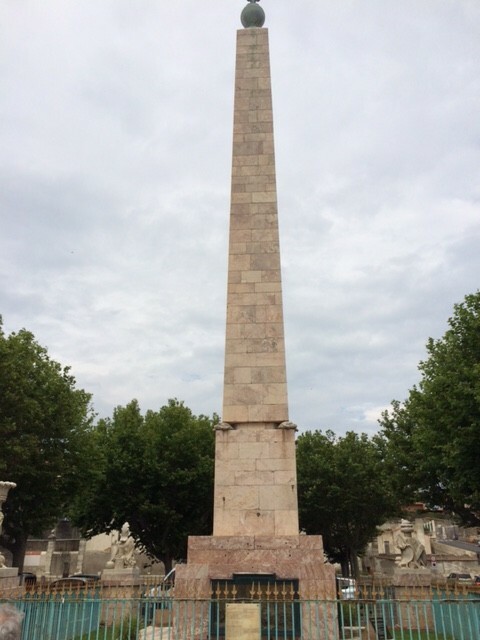 We visited the only touristy thing to see in town, a tall obelisk, the only one in France dedicated to King Louis XIV, who lost his head, not long after commissioning this elegant tribute to himself. We should have taken the tram train to the nearby scenic town of Coulliet, with its beaches and old castle, but we chose to have a leisurely lunch, and another chance to catch up on emails at one of the cafes. Later in the evening we had a farewell dinner with our new found friends, exchange stories one last time and traded business cards with promises to connect on social media. The nice thing about traveling on a cruise ship is that you unpack only once. The downside is having to repack and figure out what to do with all the tchochkes and gifts we bought all week. The logical decision was to buy a suitcase in Barcelona because we were perilously close to being over weight on our already overstuffed bags. 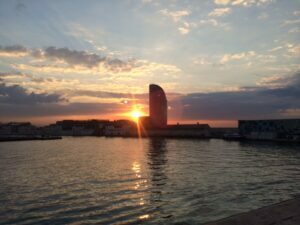 We awoke to a beautiful sunrise over the Iberian coast as we sailed into the port of Barcelona. The sailed shaped W hotel rises from the shore like a tail fin on a shark. It is an odd contrast to the rest of the port area, which is pretty commercial in nature. There were a few more goodbyes at our last breakfast, including several of the crew who were outstanding in providing us with great service. Then, it was off to a two day adventure in the capital of Catalan.